Click the link to the right (next to the strawberry) to access our online store. 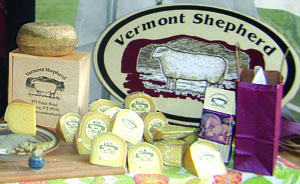 Here you can order cheeses, wool, or our other farm products. The cheeses may be ordered eighth, quarter, half or whole wheel - that is from a 3/4 lb wedge up to a 6 lb wheel. We ship anywhere in the continental U.S. and make sure packages spend a maximum of 3 days in transit, so you can be confident your order will arrive intact & delicious (click here for more shipping info). Shipping is included in all prices. We use a secure (PCI-compliant) credit card processor and we never share your personal information with any third party.